Staying on top of the latest fashion trends seems like it could be a full-time job. After all, trends seem to change with the wind. So, to keep you up on the current runway and designer trends, here are some of the top trends in jewelry for 2019. Sport these types of jewelry and your look will be on point and the hit of any party. Everyone knows how beautiful autumn falling leaves are, so why keep them just for autumn? Now you can wear fall leaves-inspired jewelry and be fashion forward and chic. Leaf jewelry in gold as well as tri-color gold are big hits. Some leaf jewelry even comes in more realistic leaf colors, including red, orange, and yellow. Wear it in the fall or throw everyone for a loop and sport these jewels in the spring. Seashells are not just for your beach vacation anymore. Now the hippest urbanites will be sporting seashell jewelry for the most high fashion events. Seashell earrings and large necklaces are particularly popular. Also, jewelry with clumps of seashells or with shells oriented in a unique pattern are especially in vogue. Boho chic remains on trend as Wild West jewelry is hitting the runway. Everything from Native American traditional patterns and feathers to bolo ties fit into this Wild West theme. This jewelry works well with earth tone clothing and minimal makeup for a naturalistic beauty look. 2019’s fashionistas need to make a bold statement. One of the hottest jewelry trends is large statement jewelry, and specifically, necklaces. Runways are featuring some nearly full-torso necklaces, including very large chain link necklaces. Many designers like to pair a bold chain link necklace with a matching chain link bracelet. It gives you an edgy yet sophisticated look. Large statement necklaces work best with shirts or dresses in either a block color or with a very subtle pattern. In general, big jewelry is having a great year in 2019. Very chunky bangle bracelets are a favorite with models and top designers. Bright-colored bangles and bangles that use non-traditional jewelry materials, such as seashells, chain links, and wood, are very stylish. Bangles are a great partner with an evening gown or for a casual day out. Choker necklaces are making a huge comeback this year. In addition to standard wrap around chokers, open cuff chokers are also a big hit. That gap in the necklace really gives it the extra pizzazz and makes it stands out from the crowd. Also, chokers that are super fancy, such as covered in pearls or gemstones, are really popular this year. It may sound ridiculous, but what fashion forward trend isn’t a little crazy? Neck bags are all the rage. That’s right, a small-ish purse that you wear like a necklace around your neck is one of the coolest jewelry trends. Most models also sport a purse, so the neck bag is most decorative and not super functional. But wearing a neck bag will certainly earn you street cred among the runway set. Hoop earrings will never go out of style, but 2019 is putting its own stamp on these classic jewelry items by opting for crescents instead of full hoops. Large or small crescents in any and every tone of metal are popular. You can wear two or even opt for the trendy single-ear earring style. Designers have always liked to brand their logos and put them all over their company’s fashion-forward items, but these year logos are exploding! Expect to find designer logos all over the runway, and not just on clothes and handbags. This year, earrings, necklaces, and bracelets are all featuring the high fashion’s biggest logos. Large earrings are very trendy right now. Also asymmetrical earrings where one is substantially larger than the other are really hot. Some models are even wearing only one statement earring and nothing in the other year. Regardless, statement earrings are on point in 2019. Coins, or gold meant to look like coins, have been fashionable for a while. It gives your outfit a great, vintage feel. But this year, coin and medallion are getting bigger and bolder and are making a huge splash on the runway. Coins and medallions are great for necklaces, bracelets, or earrings. It seems everything that was once popular goes out of style and then makes an epic revival. Jewelry styles from the 1980s are definitely retro and are coming back in a big way in 2019. Geometric shapes in neon colors or in black and silver are very popular this year. Pull out your Teen Beat, check out old Janet Jackson photos, or watch Saved by the Bell reruns to get some ideas for some retro cool options. 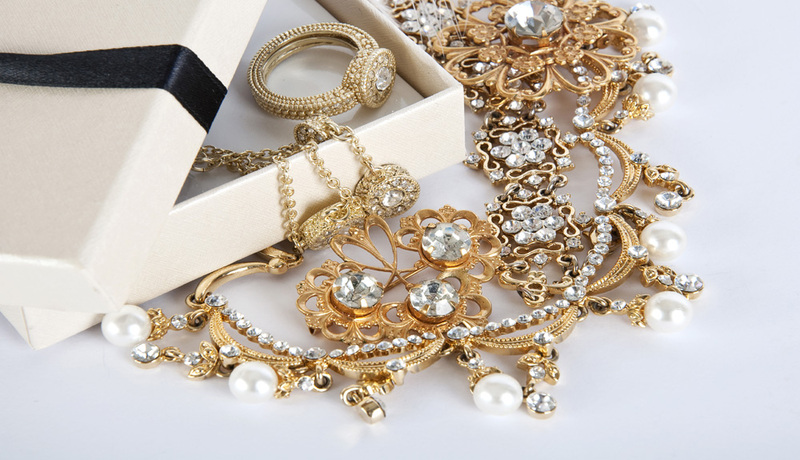 You may even be able to hit up your mom’s old jewelry box for some great, now back in style, options! This is the year that jewelry expands its territory. It’s not just for your neck, ears, and wrists anymore! You’ll see jewelry head pieces, body gold strings that stretch over your whole torso, or bracelet that wind their way from fingertips the whole way up the arm. If you like to be an early adopter of a new trend, seek out jewelry that you can wear in unique places on your body. Wear what makes you feel beautiful and you can’t go wrong. But if you feel like your jewelry collection is getting stale, check out these trends to update your collection with some totally fashionable 2019 jewelry options.